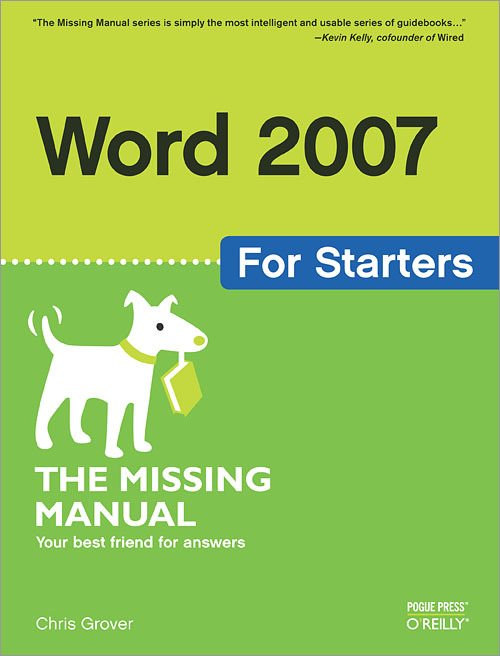 Fast-paced and easy to read, this concise book teaches you the basics of Word 2007 so you can start using the program right away. Not only will you learn how to work with Word's most useful features to create documents, format and edit text, share the results and more, you'll also discover how to go beyond basic documents to handle graphics, create page layouts, and use forms and tables. Word is used primarily for word processing, but there's more to this powerful program than meets the eye. It also offers a staggering array of advanced features that were once found only in page layout programs and graphics software. Many of these features are hidden among Word's cluttered menus, and even the pros can't find them all. For Word 2007, Microsoft redesigned the user interface completely, adding a tabbed toolbar that makes every feature easy to locate. Unfortunately, Microsoft's documentation is as poor as ever, so even if you find the features you need, you still may not know what to do with them. Word 2007 for Starters: The Missing Manual helps you master Word's redesigned user interface and gives you exactly what you need to create unique, attractive and effective documents. Christopher Grover received degrees in Creative Writing and Film from Emerson College in Boston, Massachusetts. He's worked as a technical writer, advertising copywriter and product publicist for more than 25 years. His freelance articles have been published in a variety of magazines from Fine Homebuilding to CD-ROM World. Chris's latest project is launching Bolinas Road Creative, an agency that helps small businesses promote their products and services. He is also the author of Word 2007: The Missing Manual, and co-author of Digital Photography: The Missing Manual.